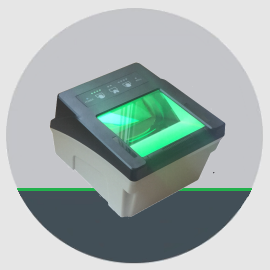 The BioRoll™ is an industrial level roll finger scanner that delivers accurate and reliable results for both criminal and applicant biometric identity management. 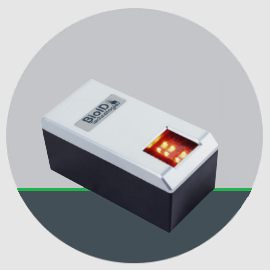 The BioRoll™ employs the most advanced optical technology, algorithm and dedicated special light sources that allow high speed print image capturing and seamless image processing, and ensure the best image quality for both flat and rolled fingerprints. The BioRoll™ is absolutely your logical choice for all your criminal and civil related fingerprint enrollment and identification applications. Contact us for more information. The BioPalm™ is the compact and lightest livescan system in the industry for criminal identification, forensic analysis and suspect enrollment. The BioPalm™ scanner employs the most advanced optical technology and dedicated special light sources that enables users to obtain the highest quality images including flats, rolls, slaps, palm and writer’s prints. The BioPalm™ is absolutely your logical choice for government and law enforcement agencies handling criminal bookings and forensic applications. Contact us for more information. The BioSlap™ is the compact ten-print livescan device FBI’s IAFIS Appendix F certified to capture four finger slaps, two thumbs or rolled fingerprint simultaneously. The BioSlap™ employs the most advanced optical technology and dedicated special light sources that allows high speed print image capturing and seamless image processing, which ensure the best image quality for slap prints as well as for rolled fingerprints. 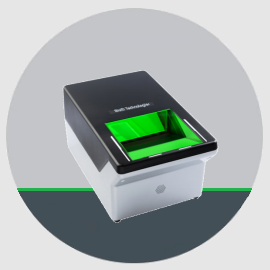 The BioSlap™ is absolutely your logical choice for all your civil or criminal identification applications. Contact us for more information. The BioSlim™ is a high-end fingerprint scanner that meets the U.S. government’s stringent biometric standard FBI PIV IQS specs and delivers the reliable results for applicant biometric fingerprint identity management. The BioSlim™ employs the most advanced optical technology, algorithm and dedicated special light source that allow high speed fingerprint image capturing and seamless image processing which ensure the best image quality of prints. The BioSlim™ is absolutely your logical choice for commercial and civil related fingerprint enrollment and identification applications. Contact us for more information. Should you have questions in mind or need more information, please drop us a line and keep up with BioID Technologies' news and updates. Copyright © 2019 BioID Technologies Limited. All Rights Reserved.